On 3 November 2018 the Human Rights Council President presented the Report of the Human Rights Council A/73/53 to the Third Committee of the UN General Assembly; on 13 November 2018, the Third Committee tabled the Africa Group co-sponsored Resolution A/C.3/73/L.56 on the Report of the Human Rights Council. Both the Council President’s presentation and interactive dialogue with Third Committee members, and the limited series of statements interspersed with the tabling and voting on the subsequent resolution, raised current challenges, reiterated longstanding critiques, and explored the Third Committee’s relationship with its controversial mechanism. In his presentation to the Third Committee, Human Rights Council President Vojislav Šuc noted that the Council provides a nexus between human rights and the SDGs, while also linking human rights with sustainable development and Agenda 2030, a view echoed by member States. President Šuc described Council reform initiatives as especially aimed at allowing small delegations more space, and more time for debate. He described the reform process as involving open-ended consultations on efficiency and effectiveness, aimed at reducing workload and meeting hours, and efforts made on the rationalization of resolutions and taking advantage of technological innovations. Reforms are also intended to secure more time for the Council to focus on human rights priorities; avoiding the mushrooming of issues and streamlining the Council’s program of work, including through the biennial-ization and triennial-ization of resolutions. He also emphasized that New York and Geneva should work together, with shared focus on both sides of the Atlantic, narrowing the divide through action. The President noted how the mechanisms and tools of the Council can contribute to the Secretary-General’s prevention agenda. He described how the Council can be a source of invaluable information, expertise and analyze brought to Council directly from the ground, through Special Procedures mandate holders, and civil society. He noted how such information could be critical to organs in New York seeking to make informed decision when discussing peace and security, and prevention. President Šuc also took the opportunity to condemn reprisals against civil society and human rights defenders engaging with the Council, and threats made against Special Procedures mandate holders (the latter of which resonated strongly at this Third Committee session due to the Burundi delegation’s threats to take the authors of the Committee of Inquiry Report on Burundi to court for liable). President Šuc urged countries to cooperate with mandate holders and pointed out that the active participation of civil society and national human rights institutions is essential for the Council, bringing attention to human rights situations, and playing a fundamental role in follow up and capacity building. In the interactive dialogue, the European Union and Brazil called for enhanced interaction between Geneva and New York, to strengthen institutions and bring human rights to the core of the agenda. Cuba, on the other hand, specifically opposed a link between the Human Rights Council and Security Council. The United States raised both issues of concern and of approval with the Council (see URG’s blog on the US’ seeming flirtation with the Council here). Hungary, while noting concerns about selectively and workload politicization, urged that the Human Rights Council should not be looked at like an enemy, but as an institution promoting and protecting human rights. Latvia also emphasized that human rights is more than a pillar of the UN, it is the backbone. The Africa Group stressed the need to build resilience, and argued that economic, social and cultural rights, including the right to development, should be discussed on equal footing. They condemned what they saw as the politicization of the Council, and the stubbornness of the global north. On the contrary, Lichtenstein, representing states including Australia and Iceland, noted that no state with gross human rights violations should be admitted to the council, citing concerns about the presentation of clean slates in the last Council election, that including six countries where human rights defenders faced hostility and threats. Several States stated that they believed that the UPR is the only credible mechanism to address human rights issues. They argued that the rest of the Council falls prey to politicization and selectivity, and has recently adopted overly intrusive methods and acted without the consent of the countries in question. There was pushback on the use of country specific resolutions as causing conflict in what should be a cooperative body, as well as a questioning of the credibility of non-consensus resolutions. Other states took a different approach, pointing out the advances their countries had made in the realm of human rights, including the integration of international legal frameworks into their legislation and constitutions. Kazakhstan also took the opportunity to inform the Committee that it was putting forward its candidacy for the Council starting in 2022. On 13 October, the Third Committee tabled Resolution A/C.3/73/L.56 on the Report of the Human Rights Council, and opened the floor to State comments. The two key areas of debate were the procedural credibility of the resolution and the inclusion of country specific measures and mechanisms in the Council Report. On procedure, the Africa Group defended its decision to have the Council report tabled as a resolution in the Third Committee, as it opposed submitting the Council Report to the General assembly without the endorsement of the Third Committee. This was not uncontroversial however, and the Committee saw a number of States speak out in opposition to this decision. Costa Rica pointed out that procedurally speaking the resolution creating the Council clearly stated that the Council shall present a report to the General Assembly, while only recommendations should be presented to the Third Committee. Lichtenstein, speaking on behalf of Australia, Canada, Iceland, New Zealand, confirmed this, noting that with A/Res/65/281 the UN reached an understanding that the Third Committee will discuss the recommendations of the Council, while it is the responsibility of the plenary of the General Assembly, and not of the Third Committee, to take action on the Council report. Austria, speaking on behalf of EU, shared this view, adding that for the Committee to take note of the entire report in a broad resolution is problematic and ignores the prior agreement on the allocation of report to both the plenary and the Third Committee. The EU also added that it hoped that in future a full discussion will take place before the tabling of this resolution. The United States also stated that it continued to view the resolution of the Report of the Council as procedurally unnecessary, though it more broadly objected to certain aspects of the Council including the focus on Israel and the credibility of Council members. 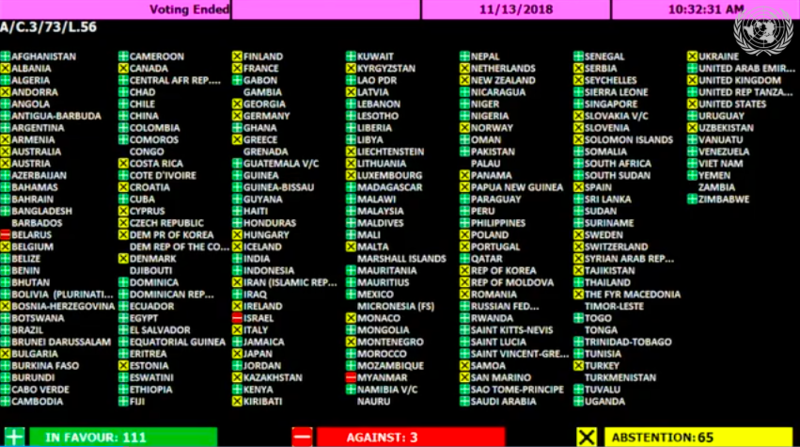 All of the States speaking out against the report did so in protest of country specific resolutions, particularly targeting human rights abuses in their countries. Eritrea and Burundi expressed support for the Africa Group and voted for the resolution but they, along with Syria and Iran (who both abstained), stated their opposition to country resolutions contained within the report (particularly those targeting them.) The three states that voted against the resolution justified their decision to the Committee; Israel called for a vote on the resolution, condemning institutional bias against Israel; Belarus accused the Council of being more oppressive than creative; and Myanmar voted against the resolution in opposition to the Council’s reports on Myanmar which the delegate claimed were politically motivated, intrusive, sovereignty infringing, and not adopted through consensus. 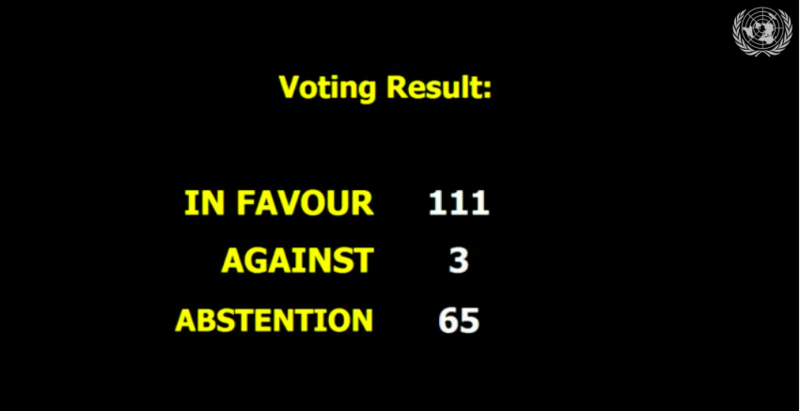 The resolution on the Human Rights Council report was also not adopted through consensus, but rather by vote, with a significant number of abstentions.